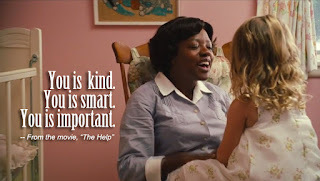 In the film "The Help," the character Aibileen Clark speaks a phrase to the young character Mae Mobley. 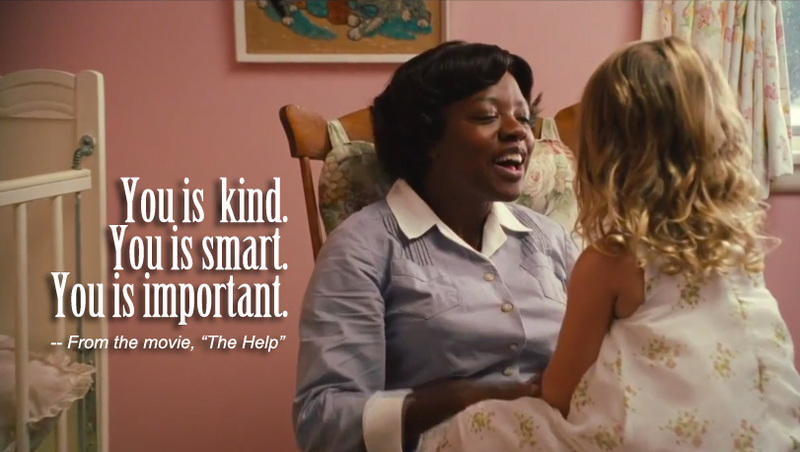 "You is kind. You is smart. You is important." Grammar isn't the focus here. Aibileen is being intentional and pouring affirming words into a hurting child. She reminds her of this several times. Mae also repeats these words. To take the moment a step further - while building up the young girl, Aibileen's words could just as easily help encourage herself. Hearing something isn't enough. You need to say it aloud and believe the words as truth. Since beginning my job search two months ago - the layoff was three months ago but feels longer - I have received many phrases in emails that I could allow to define me. A few times, I did just that. I sank into the phrases and felt worthless, useless, unmarketable. However, if I give these words power to define me and control my mood...that's on me. I choose how to perceive these words. I can allow them to encourage, inspire, or motivate me. I can allow them to defeat, destroy, or depress me. When you face these swamps in life, you have the same choice. What will you do? I'm listing these phrases below. These aren't all that have come into my inbox. While some may read similar, they are all from different companies. I will receive more. Yet, I list these to boldly say that these words do not define me! A job does not define me! I am so much more, and for me it begins with being a child of the King. Everything pales into importance and significance. After careful consideration, we regret to inform you that your experience does not match our current needs. While your skills and background are impressive, we have decided to move forward with a different candidate. Unfortunately, at this time, you have not been selected to move forward with the next phase of the process. While your experience is impressive, we’re sorry to say that we've made the decision to proceed with other candidates whose experience is more closely aligned with our needs at this time. Unfortunately, you are not the right fit for the position at this time. Although we were impressed with your background and experience, we have decided to pursue other applicants who more closely reflect the needs of this position. While we are impressed with your qualifications, we are moving forward with other candidates for this role. Unfortunately, we have decided to move forward with other qualified candidates. At this time we have decided to pursue other candidates whose background and skills more closely match our requirements for this position. After careful review, we have decided to move forward with another candidate. While your skills are certainly impressive, we have decided to pursue other candidates for this position. Although you have many skills and talents that we appreciate, we have hired a candidate who we believe to fit our specific needs a little more closely. We genuinely appreciate the time and effort that you put into pursuing this position within our organization and would like to wish you success in your search for a suitable career position. While your background and experience are impressive, we have decided to pursue other candidates whose qualifications and credentials are a closer fit for our current needs. Consequently, we will not be scheduling an interview for you at this time. We will not be proceeding with you as a candidate for this position.